In a few days, Michael Bills, a 26-year veteran of FedEx Express, will jump in a straight truck at the Greater Columbus Convention Center in Columbus, Ohio, for a shot to become the country’s top trucker at the 81st annual National Truck Driving Championships. The grand champion at the North Carolina truck safety contest in May, Bills is a six-time qualifier to the nationals who won the overall top prize in the step van division last year. In 2014, he was part of the team that brought home the state trophy. His decorated driving résumé notwithstanding, Bills will have an uphill climb on his road to acclaim and victory at nationals Aug. 15-18. The straight truck class includes a deep field of drivers led by national grand champion from 1990 Bob Dolan, an XPO Logistics driver from Pennsylvania, as well as rising star Dan Norgaard from South Dakota, who drives for Old Dominion Freight Line. Still, after devoting weeks to studying the “Facts for Drivers” book competitors will be tested on, and going over pre-trip inspection drills and driving maneuvers, Bills said he likes his chances. “[I] prepare myself mentally. I think that helped me a lot last year to win the national championship as a step van,” he told Transport Topics. This year will be all about “staying focused on kind of [the] task at hand … then practicing your routine,” he added. If the tournament rewards those drivers with experience, then Dolan and the five other former grand champions are bound to perform well. Last year’s winner, Roland Bolduc of FedEx Express, is competing in the 5-axle. 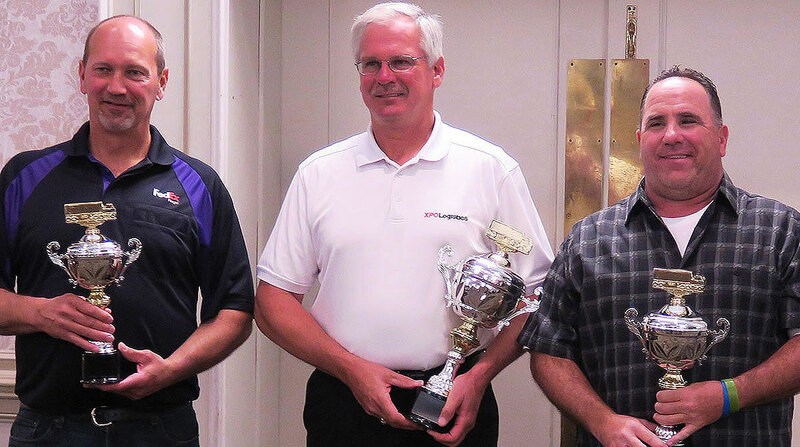 Jeff Langenhahn of XPO Logistics was 2014’s top winner, and he will compete in twin trailers. Don Logan of FedEx Freight won in 2012 and will compete in tanker. Dennis Shirar of Walmart will battle it out in the flatbed class, while Alphonso Lewis of YRC Freight will look to shake up the field in the 3-axle. Shirar and Lewis were grand champions in 2008 and 2007, respectively. In a series of interviews with drivers, most of them emphasized the importance of practicing. Scott Woodrome, Ohio’s grand champion from FedEx Freight, and last year’s national tank truck champion, will again test his skills in tanker. He, too, agreed practicing was the antidote for failure. Frito-Lay’s Brian Singelais, Massachusetts’ grand champion seeking to match Bolduc’s feat last year, emphasizes the importance of studying the “Facts for Drivers” manual, and displaying discipline throughout the three-day competition. “A lot of times, especially at nationals, the competition is won in the back room, between the written test and the pre-trip. So it’s going to be really focusing on my routine when I pre-trip a truck. So it’s basically muscle memory. You do it without thinking. You know, ’cause you don’t have time to think,” Singelais explained. Meanwhile, two state grand champions who also will be testing their talents at nationals are American Trucking Associations’ Road Team captains. They are Oregon grand champion Chris Outen of FedEx Freight in the sleeper berth class, and Idaho’s Timothy Melody of ABF Freight in tanker. With 31 years behind the wheel, Outen has racked up 1.6 million safety miles and has competed in straight truck, twins, 3-axle and 4-axle. He is aiming to win a state championship in each class. After his father’s death in a car accident, Outen is passionate about safe driving. With 19 years of driving under his belt, Melody has racked up 3.2 million safety miles. In 2013, he won the twins division at nationals. In order to encourage drivers at his terminal to participate in the truck driving championships, Melody said he switched to the tanker class last year. At nationals, drivers are tested on the “Facts for Drivers” manual, a pre-trip inspection, and a skills course in their class. The overall top scorer will be announced Aug. 18, and she or he will take home the grand champion best-in-show. When they’re not seeking to win trophies, most of the drivers said they enjoy showcasing their skills at the national level and appreciate the lessons they learn along the way. Rick Cates, a vice president with Marsh USA Inc. in North Carolina, is a lifetime member of the championships’ executive committee. Experience is not overrated, Cates explained. And while the national tournament truly is wide open this year, he likes Woodrome’s chances. Keegan Wiggins contributed to this report.